Juniperus Conferta 'Silver Mist' is a fast growing groundcover plant that can be grown in USDA Plant Hardiness Zones 6A through 9B. It matures to an average height of 1 foot to 2 feet and an average width of 2 feet to 3 feet, depending on climate and other environmental factors. It prefers growing in a location that provides full sun, morning shade with afternoon sun or filtered sun and grows best when planted in loam or clay soil that is well drained or moderately drained. The foliage is grey / silver and medium green in color. 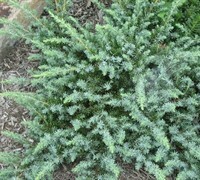 Silver Mist Juniper is known for its outstanding silvery-grey foliage color and ground hugging growth habit. The spruce-like grey foliage adds a unique texture and contrasts nicely with many other plants in the landscape; particularly those with dark green purple, red, burgundy or golden foliage. 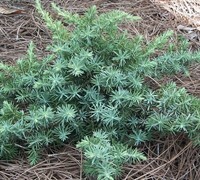 Plant the Silver Mist Juniper in locations that provide well-drained soil and full sun to partial shade. Tolerates more shade than other junipers. It is an exceptionally low maintenance plant that is very drought tolerant when established. Silver Mist Juniper is useful planted in mass as a groundcover on slopes and embankments or as a border in landscape beds and foundation plantings. It is also useful in both the landscape and in containers to cascade over walls. Great product. Shipped well and fast. Plants appear very healthy. Thank you! Highly recommended. Beautiful plants arrived in better condition than the same type plants that have been in my yard for a year--from another vendor. These were actually bigger and healthier.THANK YOU for great service. I was somewhat hesitant to buy evergreens online. There is another vendor called Direct Gardening that has horrible reviews. I initially confused GardenerDirect.com with that vendor. In any event, my plant material arrived promptly and was in perfect condition. Well packaged and kept damp during transit. I planted them right away- they look very healthy. This was a varietal that I just couldnt get locally. I will definitely buy from GardenerDirect.com again- many thanks Spencer!